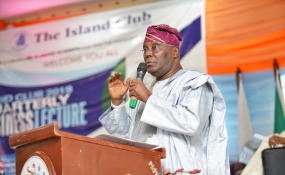 The Peoples Democratic Party (PDP) has described as "reckless and groundless" claim by the All Progressives Congress (APC) that its presidential candidate in the just concluded general election, Alhaji Atiku Abubakar, is a Cameroonian. With these results, PDP has won all the seats in the 32-member House of Assembly except Oyigbo State Constituency, which was won by Mr. Nwankwo Promise of the Social Democratic Party (SDP). He stated: "This disingenuous claim is also a woeful design by the APC to overburden, distract and bog down the Presidential Election Petition Tribunal with trivialities, lies and falsehood, so as to derail the course of justice. "Whereas Atiku Abubakar's citizenship by birth, even under our Constitution, cannot be contested, it is indeed the biggest irony of the year, that Atiku's citizenship is being disputed by individuals whose ancestry has always been a subject of debate. "These individuals include those who, being not sure of their origins; have no love for Nigeria and even refused to be on the side of our nation at the 1985 summit of the defunct Organisation of Africa Unity (OAU) in Addis Ababa. "Such persons prefer to deploy our national resources for infrastructural development in affiliated places outside the shores of Nigeria, when our country is in dire need of attention. "Moreover, this claim by APC appears to contain explanations as to why its administration has remained insensitive to the challenge of insurgency, general insecurity and economic travails of Nigerians in the North-east, particularly in Adamawa, Yobe, Borno and Taraba States." Ologbondiyan noted that the PDP has implicit confidence in the competence of the party's legal team to handle the diversionary antics and technicalities of the APC to unnecessarily overstrain the tribunal and derail the course of justice in the matter. In last Saturday's supplementary election, the police deployed 3,066 personnel, complemented by personnel from other security agencies to ensure a hitch-free exercise. "Nobody has won and nobody has lost the elections. But Rivers State has won. I forgive anyone that has wronged me and I also ask for forgiveness from those that I have wronged," he said. "We have come here to give God thanks because He is so faithful to us. We have come to thank God for the fight He fought on our behalf. It is only God who can fight for us. We have no power of our own to fight," he stated. Speaking at the thanksgiving service, Ibiyeomie prayed God to accept the governor's thanksgiving and bless him. He decreed God's wisdom on the governor, adding that God would grant him the enablement to lead the state in the right direction.